“Perform physical exams on chickens” is not commonly on a college student’s to-do list. But this past fall, it was a weekly task for every student enrolled in the College of Life Science and Agriculture’s poultry production and health management course. That’s because along with attending class, each student spent at least two hours a week caring for 48 Red Ranger broiler chickens from hatching to processing as a part of the course’s new accompanying Poultry Experiential Education Program (PEEP). 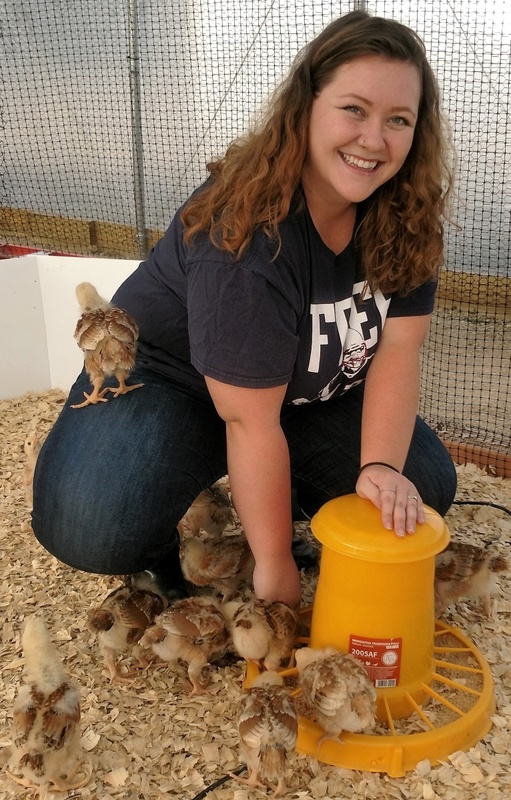 Ashley Bruns '19 cares for the chicks during her shift. The program gives students the opportunity to immediately apply the concepts they’re learning and develop a specialized set of skills and knowledge that can only come from hands-on experience. Dr. Vanessa Grunkemeyer, veterinarian and lecturer in the department of agriculture, nutrition, and food systems (ANFS), developed and manages the program and was responsible for overseeing the students’ work and flock health. To that end, Grunkemeyer made sure the students understood how the decisions they made — from the variety of bird raised to the type of feed used to the social and physical resources provided for the birds — influence the birds’ wellbeing, the sustainability of the flock and financial viability of the poultry operation. Students also spoke with local New Hampshire producers, including John Hutton from Coppal House Farm in Lee, and Cameron Whitehead, director of supply chain, and Abby Keaveney, quality assurance manager, from Pete & Gerry’s Organic Eggs in Monroe, who visited the campus as guest speakers. The birds were processed off-site when they were 12 weeks old and made available for purchase by PEEP students and ANFS faculty and staff. The proceeds from the sales will fund future PEEP outreach, including more speaking events with industry experts. The PEEP program is based in UNH’s new teaching animal high tunnels, which were completed in 2018 and are adjacent to the UNH Fairchild Dairy on the northwest edge of campus. The tunnels have built-in heaters and fans controlled by a programmable thermostat, assuring proper temperature and ventilation is maintained at all times. Along with daily care from Grunkemeyer’s students, the birds enjoyed a wide area to roam inside the sunlight-filled 1,800-square-foot tunnel, complete with chicken-size swings, perching platforms and hanging treat feeders. They also spent time in an exterior 900-square-foot fenced-in foraging area accessed through doors at the rear of the tunnel. The high tunnels were funded by the College of Life Sciences and Agriculture and the Oliver J. Hubbard Fund. Oliver J. Hubbard, class of 1921, a pioneering chicken breeder and geneticist, established the Hubbard Fund in 1976 to support animal sciences education. "To me, PEEP reflects the finest qualities of our UNH learning community: an experiential, substance-rich program that brings students’ studies to life." Currently, enrollment in the poultry production and health management course, whose students participate in PEEP, is capped at 20 to allow time for each student to have a meaningful amount of hands-on experience caring for the chickens. Grunkemeyer hopes to eventually offer the class in the spring semester as well, doubling student capacity. And the program isn’t just for future chicken farmers. Dave Mortensen, professor and chair of the department of agriculture, nutrition, and food systems, who had a chance to observe the students and the flock, agrees. Learn more about UNH's animal science program.